After seeing my future Wedding Wednesday co-host Macy's post on choosing wedding colors last week, I thought it would be fun to share how we chose ours. Keep in mind, as you read, everything below was planned when we were in Connecticut with no real thoughts of moving to Charleston... yet. To be honest, I guess this post is also about choosing the "big stuff" for our wedding, too, so enjoy! First, we picked a season. Summer was (and still is) the busiest season for me. I am not a winter person, so that left spring or fall. Mike proposed in August, and I knew I would need at least a year to plan so I didn't kill myself (or him). Originally, I was thinking Spring 2015, but when he told me that he really didn't want to have to wait that long to be married, it didn't take any convincing to agree on Fall 2014. Then, we chose our venues. We knew there would be two because getting married in a church was important to us. We went back and forth between my hometown and his, my church and his, but then I decided to throw my college town into the mix. It's an hour from both of our hometowns and also less than an hour from Boston. We agreed instantly and both already loved my college chapel. (Tangent: there is a myth at Holy Cross that girls need to pick their wedding date when they apply because the chapel books weddings 7 years in advance: WRONG, freshmen; it's only one year.) Because the chapel only does weddings on fall Saturdays with no football games, our date was pretty much chosen for us. We could either do early August (before football season), September 20, or November 1. September 20th - SOLD! After that, we found country clubs that could accommodate the 20th and my mom found Wedgewood Pines on The Knot. Another easy decision! After that was Pinterest. Oh, Pinterest. Do yourself a favor and never search, "wedding colors," "wedding color schemes (season)," or anything like that if you're planning a wedding. Not only will it give you a million ideas you never thought of, but it will make you LOVE every single one of those ideas. I remember making this and bringing it to my sister-in-law to look at... we were a little overwhelmed haha. So there I was, with a million different ideas. I had to find some way to narrow it down... somehow. I decided to look at options with purple since that was my college's color. That turned into me Googling (yes, Google images, I was way too overwhelmed by Pinterest at this point) "purple fall wedding." Everything that came back also had orange, and I thought that would be perfect for fall, but I didn't want it to look too much like Clemson (helloooooo, foreshadowing! ), so I tried to find another color to soften the orange. Enter: Mike. From here on in was his choice. He was so good at making wedding choices and I loved all of them! 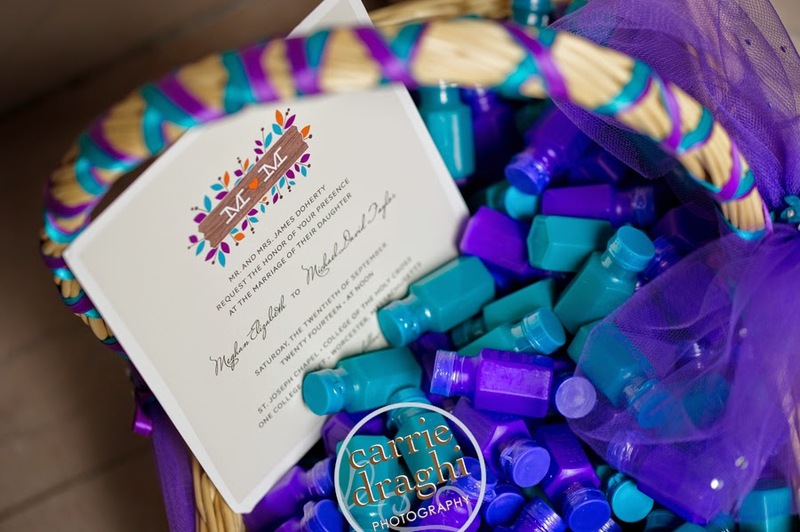 We went through the ROYGBIV rainbow searching "purple and ____ wedding." We were very close to choosing purple, orange, and green when he saw a little photo of a woman in a teal bridesmaid dress. It was beautiful! It looked great with so many skin tones, complimented purple well, and wasn't something I had seen before (my words, not his). He was sold, and I was so excited to have found something he loved so much! To make everything easier, we went with the David's Bridal colors: Oasis and Regency. Mike was all about the non-traditional non-white vest and tie for himself, so he wore Regency (purple) and the bridesmaids and groomsmen all wore Oasis (teal). Brides-to-be - ALL of the David's Bridal colors are the SAME as Men's Wearhouse colors, so it makes matching so easy!! We met with our florist, Frugal Flower, and she chose a beautiful combination of white flowers as well as purple lisianthus, calla lilies, roses, asters, stock, and statice as well as orange berries that would make everything feel even more like fall. 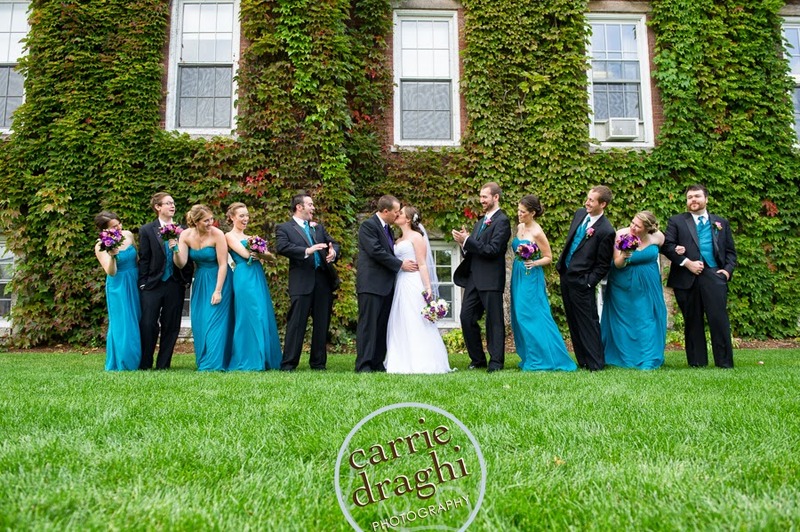 Bouquets, boutonnieres, and center pieces were wrapped in coordinating teal ribbon which brought everything together! 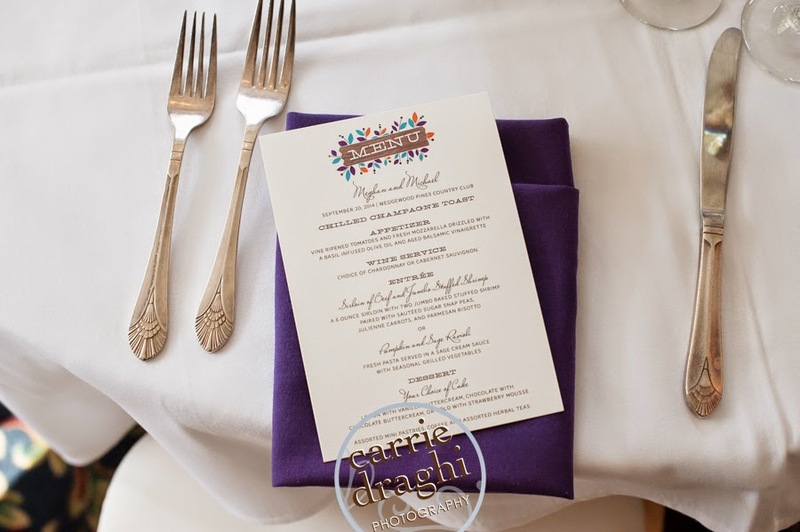 Our reception venue was also fantastic and had the perfect matching purple napkins for each table. 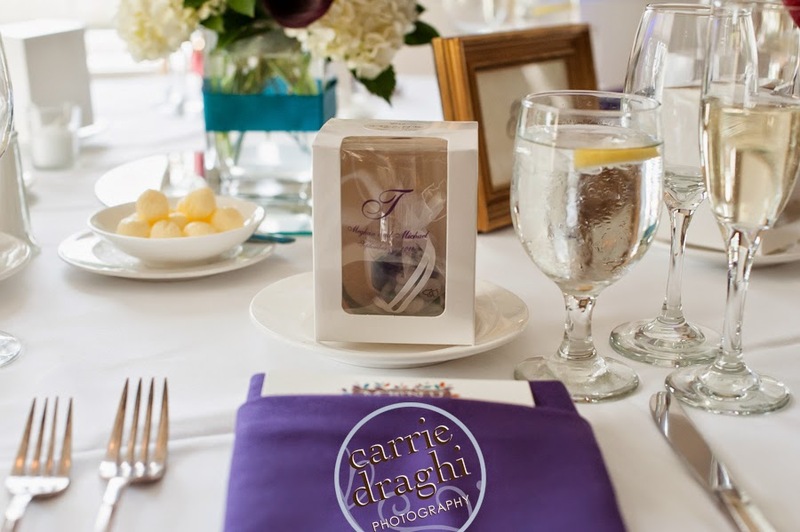 They looked so great with the centerpieces and favors (more about those soon!) which featured purple and teal M&Ms - hello, we are M and M! 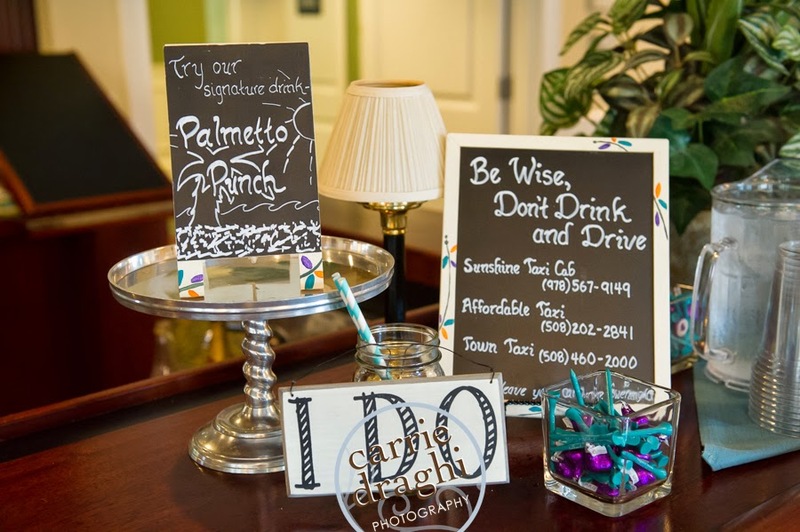 :) We also brought in signs I hand painted, details like straws to go with our signature drink, and little boxes of purple kisses and teal golf tees (all personalized) that were scattered across the country club. Our cake baker, The Icing on the Cake, even had a great relationship with the florist, and they worked together to match the same ribbon on the flower bouquets to the cake. 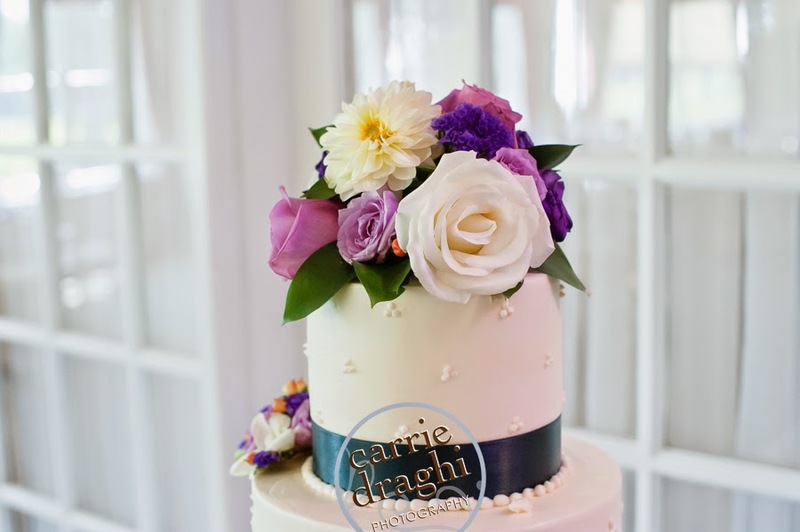 The florist even made a floral cake topper as well as little clusters on each tier that matched and fit perfectly. Lastly, everything printed (invitations, programs, menus, place cards) was also personalized and color-matched by Minted. I cannot say enough about Minted. They are a fantastic company and really go above and beyond! 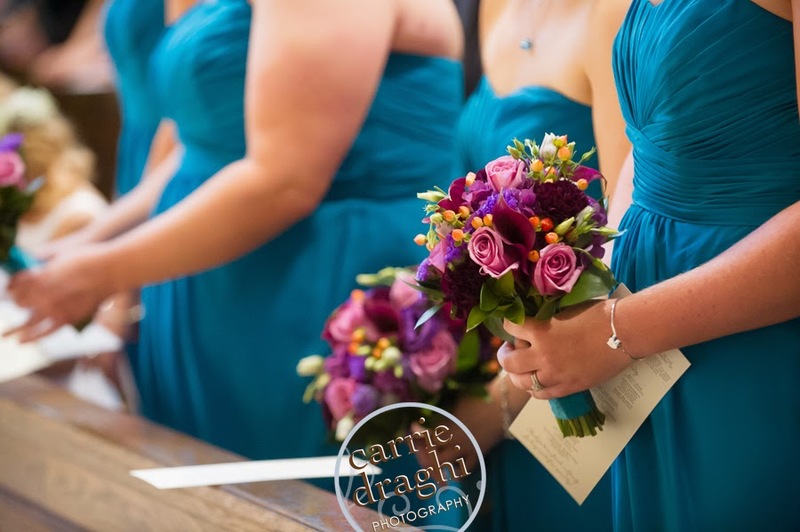 Everything truly came together flawlessly and made for the perfect purple-and-teal-with-a-little-bit-of-orange early fall wedding! 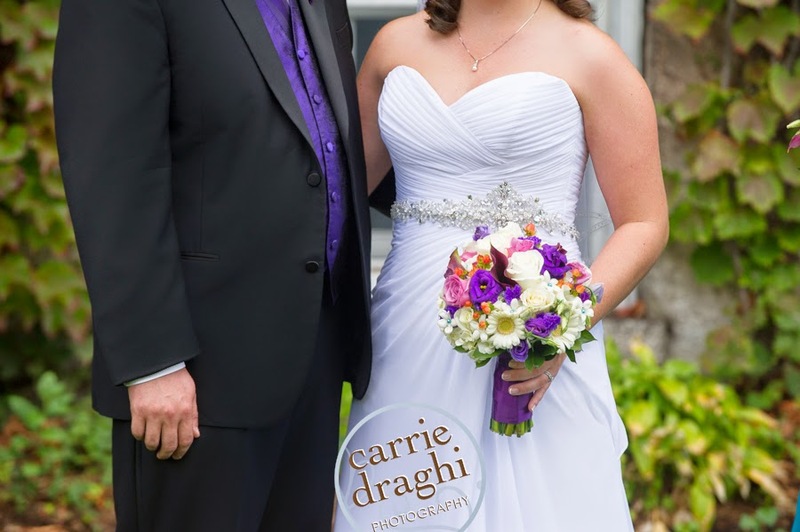 Now don't forget to link up below for Kristyn's last Wedding Wednesday. Starting next week, Macy and I will be hosting the linkup and we are so excited: me to share all of my recaps and ideas for brides and her to go through the wedding planning journey! your colors are gorgeous! those are two colors that I never would have thought could go together and yet they look perfect! This is great how you chose your colors. Ours were more like, well...we love blue. So there was that. And I wanted yellow in there too, but only pops of it. Then we settled on white as another major color. I loved how they all came together! I love that you told the story of choosing your colors! Pinterest can be SO overwhelming with just about everything, so I googled some too. The purple and teal go great together, I love the way everything turned out! The colors you used were great! We picked wine because I am a purple fan, he's a blue fan and neither one of us wanted straight purple or blue. His mom tried and tried for me to do blue, because you know, her daughters would look awesome in blue dresses, but we ended up with wine because we wanted to be at a winery and we love it all together. I'm also kinda glad Pinterest wasn't the big thing when I got married because while now I wish it was, it made it easier to not be like, "oh my god I have to make this" for the wedding. I love your wedding colors, they looked beautiful together! 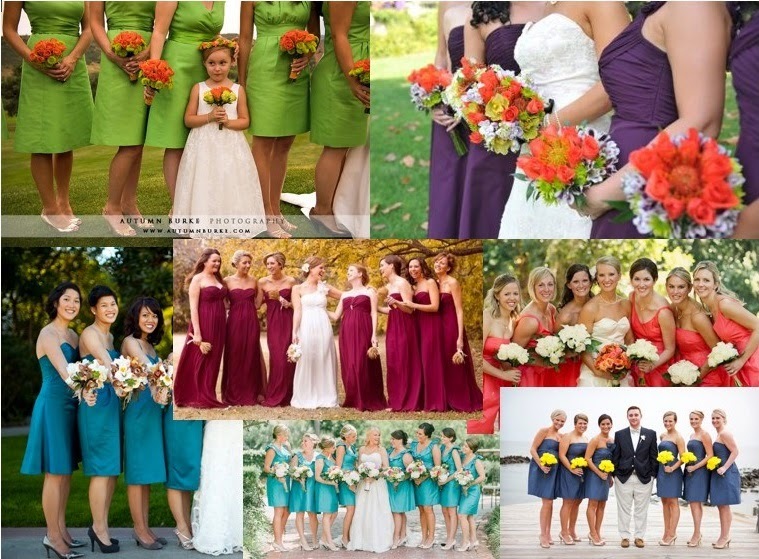 I think I've had a wedding with every one of those colors - except the green. But I bet if its on Pinterest, then its coming! Some colors, when they tell me what they are, I'm like EWWW... but then it looks great. Pinterest has helped in color department amazingly! You're right, purple and teal is not as common but very lovely combination. I especially like it for your early fall wedding date. Beautiful! Oh yea you are co-hosting! I have a few more wedding posts in mind, so I better get my act together and start posting again! I love your colors and the teal is something different but it worked really well with the purple and orange. My 5-year old niece picked my wedding colors. I was going to go with purple and sage green, but she wanted to wear a pink twirly dress, so hot pink and turquoise it was...ha! Your colors are so vibrant! Your pictures are beautiful! Your colors were perfect! I am definitely glad Pinterest wasn't a thing when I got married- I would have been totally overwhelmed too!